U.S. working mothers have had a hard time in recent years: Between 2007 and 2012, the share of female-headed working families that are low-income increased from 54 percent to 58 percent, according to a Population Reference Bureau (PRB) analysis of data from the U.S. Census Bureau’s American Community Survey. 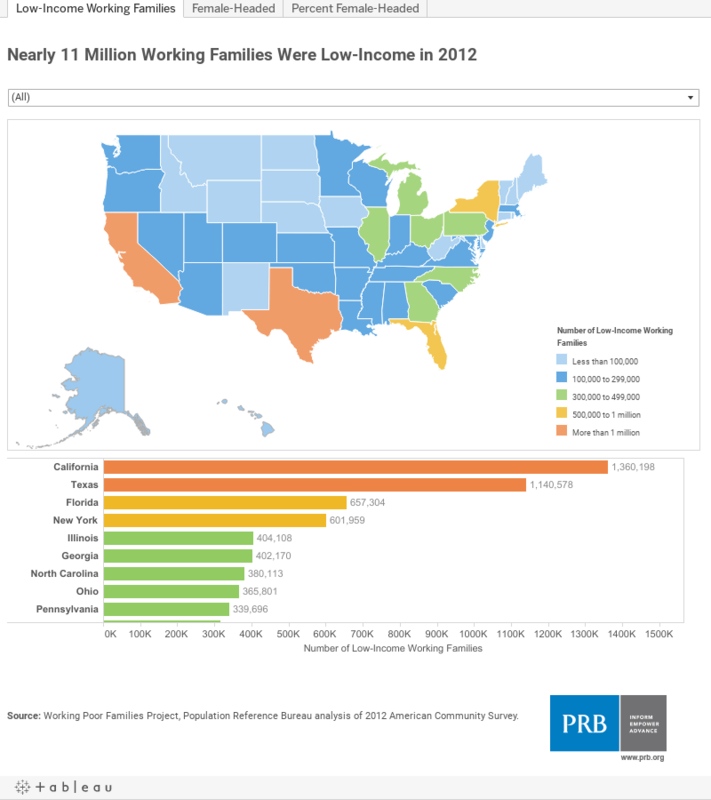 Out of almost 11 million low-income working families in 2012, more than 4 million were headed by working mothers, reports State Policy and Low-Income Working Mothers: Investing for a Better Economic Future, issued by the Working Poor Families Project, with support from the Annie E. Casey, Ford, Joyce, and Kresge foundations (see figure). "The majority of female-headed households with children work for pay, but they are disproportionately burdened by poverty, compared with two-parent families," said Mark Mather, a report co-author and PRB associate vice president of U.S. Programs. "Female-headed households make up 22 percent of all working families, but they represent 39 percent of low-income working families." In 2012, 65 percent of the children in female-head working families were low-income. The report defines low-income working families as those earning less than twice the federal poverty line. In 2012, the low-income threshold for a family of three with two children was $36,966. Most of these working mothers were concentrated in low-wage jobs in the service and retail sectors (such as health aide, cashier, or maid) that tend to lack benefits such as health insurance or paid sick leave. Home health aide was the most common occupation (7 percent) among this group. As a result of federal policy changes, these workers will be covered by minimum wage and overtime rules for the first time beginning in 2015. Hourly wages averaged about $10 in 2012, or about $21,000 per year. "More needs to be done to ensure these jobs offer benefits and family-supporting wages," says Mather. The Affordable Care Act will give more low-income working mothers access to private health insurance or Medicaid benefits, but nearly half of these families reside in states that have declined to expand their Medicaid programs, the report found. Education levels fuel the economic gap between lower-income and higher-income families: 51 percent of low-income single working mothers have at least some education beyond high school, compared with 77 percent of higher-income single working mothers (earning above 200 percent of the poverty line). Low-income single working mothers are almost four times as likely to lack a high school diploma as their higher-income counterparts (18 percent versus 5 percent). While female-headed families constitute about 39 percent of all low-income working families, the share is much higher among African Americans (65 percent), compared with non-Hispanic whites (36 percent), Asians (20 percent), and Latinos (31 percent). But whites make up the largest number of low-income working families headed by single women (1.6 million). The share of low-income working families headed by women differed by state in 2012, ranging from 21 percent in Utah to 53 percent in Louisiana and Alaska (see figure above). The share for the District of Columbia was 61 percent. The report explores effective state-level policies that improve the economic opportunity of low-income working families. It calls on state-level policymakers to expand Medicaid eligibility, provide state-earned income tax credits to help make low-wage work pay, and improve access to quality child care for low-income families. It also recommends increasing low-income working mothers' access to postsecondary training (such as providing financial aid to part-time students), promoting high-quality jobs by raising the minimum wage and tipped minimum, and implementing paid maternity leave and paid sick days.